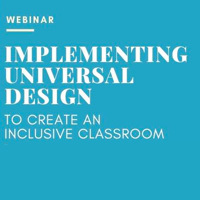 Faculty and staff are invited to attend a webinar presentation of Implementing Universal Design to Create an Inclusive Classroom, on Feb. 5 from 11:30 a.m.-1p.m. Participants will learn dozens of practical activities and strategies to implement Universal Learning Design techniques. This can help increase student access, engagement, and academic success. The webinar is hosted by the Webster University Accessibility Committee. Election Day and the Thanksgiving holiday encouraged the Accessibility Committee and the Academic Resource Center to reflect on the accomplishments of some of the United States’ most well-known individuals despite their challenges with “disabilities.” Many are well aware of some of these examples but may be less familiar with some of the more hidden disabilities that former commanders in chief have overcome and/or managed. 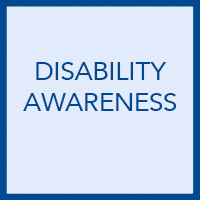 The Accessibility Committee and the Academic Resource Center (ARC) are providing weekly disability and accessibility tips this month for Disability Awareness Month. If you feel like you need to do something to assist a student but aren’t sure what to do or how to proceed, reach out to the ARC team. 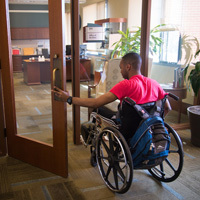 The Accessibility Committee and the Academic Resource Center (ARC) are providing weekly disability and accessibility tips for Disability Awareness Month. This week's tip is to encourage positive, appropriate interactions to create a welcoming and respectful environment for all students, faculty and staff members. The Accessibility Committee and the Academic Resource Center (ARC) are providing weekly disability and accessibility tips this month for Disability Awareness Month. Tip 2: Provide intentional inclusion. One way to accommodate individuals with disabilities is to intentionally create a place for them and provide a way for them to be included. 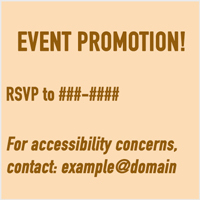 To make individuals with disabilities feel welcome, try adding an accessibility statement to the bottom of your next event flyer. 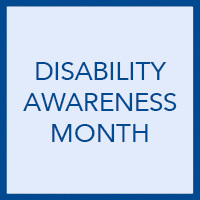 The Accessibility Committee and the Academic Resource Center (ARC) are providing weekly disability and accessibility tips this month for Disability Awareness Month. Tip 1: One in five Americans is a person with a disability, and not all disabilities are visible. A person may be born with a disability, may acquire a disability through an accident or illness, or may acquire a disability as result of aging. 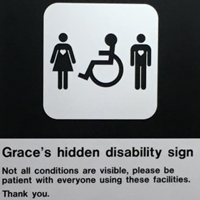 Please be aware that people may have a hidden disability. 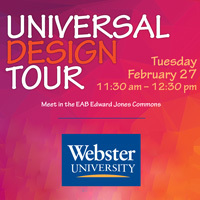 Faculty, staff and students are invited to join the Universal Design Tour on Tuesday, Feb. 27, at 11:30 in the East Academic Building. Meet in the Edward Jones Commons and prepare for a walking tour of the building, Browning Hall and Pearson House. 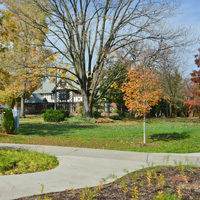 Participants will learn what Universal Design is, and how it is applied, or not applied, to three unique campus buildings. Effective Tuesday, Jan. 16, Christy Herzing will join the Academic Resource Center (ARC) as the academic ADA coordinator. Herzing replaces Shelley Wolfmeyer, who left the position in Oct. 2017. Temporary academic ADA coordinator Michelle Fassler will continue working through Friday, Jan. 26, to help transition Herzing into the full-time role and to make the transition as smooth as possible for Herzing, students, and faculty and staff members. The Academic Resource Center is partnering with Paraquad to provide a discussion-centered training on interacting with people with both visible and invisible disabilities with the Oct. 26 session, After the Letter – Best Practices for Making Accommodations in the Classroom. The government-wide workforce recruitment and referral program (WRP) connects federal employers nationwide with college students and recent graduates with disabilities who are eager to prove their abilities in the workplace through summer internships or permanent jobs. The goal is to increase the representation of persons with disabilities, especially severe disabilities, in the federal workforce. Webster candidates must apply by Oct. 12, 2016. Webster University will participate in the federal government's 2015-2015 Workforce Recruitment Program and is recruiting eligible candidates from current students and recent graduates.